We have just given final approval to the revision of Stephen Brooke's children's picture book, A MOUSE IS IN THE HOUSE, for distribution to all booksellers (Amazon, B&N, your local bookstore). If all goes well (hey, it does sometimes), it will be available everywhere in six to eight weeks. 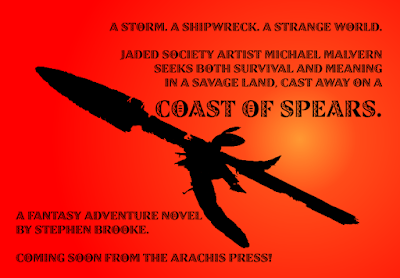 Also, this coming week the finalized versions of the new adventure novel, COAST OF SPEARS, will be sent to the printer. Although the 'official' release date is July 1, the ebook versions should be available directly almost immediately. It will take longer for it to show up elsewhere --- the print edition may not make it to places like Amazon for a couple months, alas! In keeping with our intention to eventually get most of our books into wider distribution, a new edition of Stephen Brooke's children's picture book, A MOUSE IS IN THE HOUSE, has been sent off to our printer and should soon show up at book retailers everywhere, including Amazon. Watch for it online or order from your local bookstore! And, of course, it remains available directly from us at the Arachis Press. Next comes the release of COAST OF SPEARS, and then we'll see about getting more revised books out. July 1 has been named as the official release date of Stephen Brooke's new fantasy adventure novel, COAST OF SPEARS. Look for it at book retailers or our own Arachis Press web site!